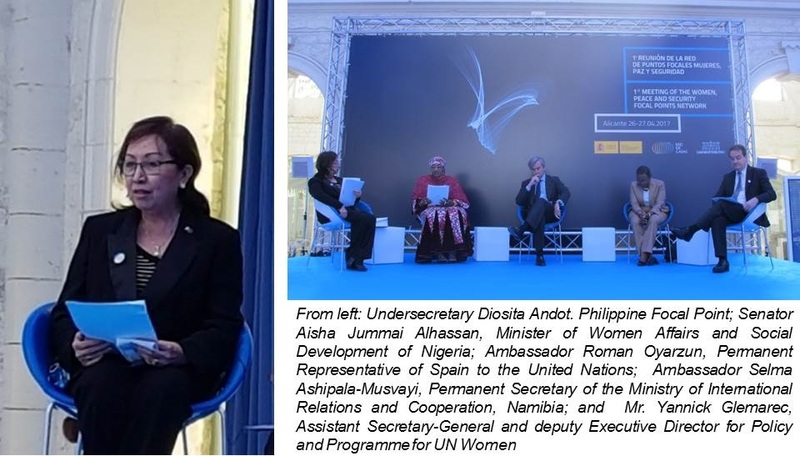 Undersecretary Diosita Andot of the Office of the Presidential Adviser on the Peace Process, together with First Secretary and Consul Mary Luck Hicarte, represented the Philippines in the First Meeting of the Women, Peace and Security Focal Points Network which was held from 26 to 27 April 2017 at the Casa Mediterraneo in Alicante, Spain. 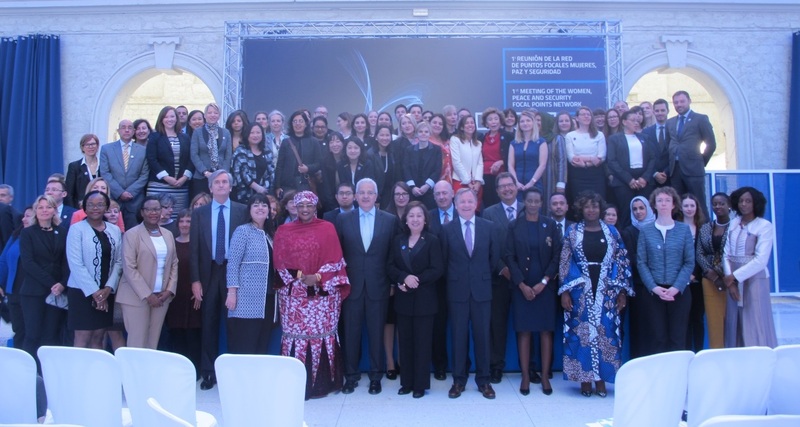 The meeting gathered more than 100 participants from 59 countries, representing government, civil society, and international organization sectors to raise global awareness and advance women´s participation in peace and security policies and programs at the national-level. Undersecretary Andot, who serves as the Philippine Focal Point, was a speaker during the Opening Plenary and Framing of the WPS Network. In her speech, Usec. Andot announced that the Philippines recently launched the third cycle of its National Action Plan (NAP) on Women, Peace and Security 2017-2022. Usec. Andot shared that the third generation Philippine NAP “adopts a broader framing of the situation of women in armed conflict and recognizes their contributions to conflict transformation.” It uses the language and precepts of gender equality. It also incorporates the context of non-international armed conflicts, such as protracted and low-intensity civil strife, ethnic and communal violence, war against terrorism and organized crime, all set against the backdrop of the ongoing peace talks with communist insurgents and the pursuit of a political solution to the Bangsamoro conflict. She expounded that the new NAP highlights the power of women both as pro-active leaders and well-engaged participants in the peace process and pays priority attention to their economic empowerment. It also takes into account the important role of the civil society to allow for the effective implementation of the national plan both at the national and local levels. As of 2017, 65 countries have adopted NAPs or are in the process of drafting one. During and after the session, a number of delegates from countries which are in the process of adopting a NAP, inquired on the Philippines´ experience in NAP crafting and implementation. Usec. Andot shared her insights and provided encouragement to other Focal Points to continue with the work of creating high-impact NAPs. In the third session, Usec. Andot joined the working group on “Preventing or Countering Violent Extremism.” The discussion in the group highlighted the importance of empirical data and research provided by civil society and think tanks, in furthering the WPS agenda. In her intervention, Usec. Andot underlined that contextualization of proposed responses to WPS issues is key, stating that “there is no one-size-fits-all solution to WPS concerns.” The working group agreed that regional cooperation as well as the involvement of the youth is mandatory in efforts to prevent and combat violent extremism. The discussion also pointed to the need to use operational effectiveness as an argument to bring the WPS agenda to a wider audience. In the debriefing for the third session, the concern over funding sources for NAPs was raised. The Philippines was cited as a country with a dedicated and institutionalized funding for Gender and Development (GAD), as it allocates of 5% of the total budgets of its agencies, local government units and other government instrumentalities to projects, programs and activities that address the needs and uphold the rights of women. The next meeting of the Network will be held in the margins of the 2017 Security Council open debate on WPS in New York in September.